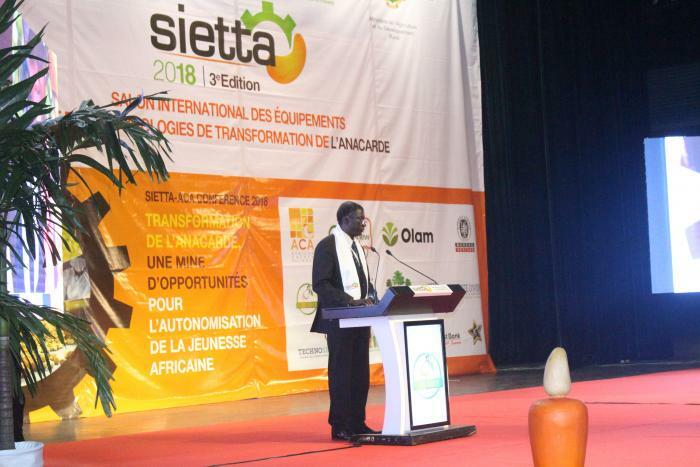 From November 8-10, 2018, cashew stakeholders from around the world gathered in Abidjan, Cote d’Ivoire for the 12th Annual Cashew Conference, which was held for the first time in collaboration with the International Cashew Equipment and Technology Show (SIETTA). Under the theme “Cashew Processing: A Mine of Opportunities for empowering the African Youth”, the 3-day conference took on the formats of: a plenary session, panel discussions, learning forums, practical sessions on equipment use, cashew by-products exhibition as well as organized Business to Business (B2B) meetings. With an objective to provide not only a quality event for all cashew stakeholders, but also offer the best and biggest platform pitching ready solutions to address the pressing needs of the cashew industry, conference participants had the opportunity to learn from more than 50 speakers in the various panels and workshops. As the theme suggests, the conference focused highly on sensitizing the youth on opportunities in the cashew industry and discussed topics ranging from employment opportunities in the industry, appropriate policy frameworks all the way to available maintenance services for cashew equipment. On November 8, the event commenced with an inaugural plenary moderated by the African Cashew Alliance (ACA). This session tackled the conference theme in general, followed by panel discussions under various sub-themes. Specifically, the inaugural plenary session had four panelists who reflected on i) Global Cashew Market Overview, ii) Favorable Policy reforms engaged by the government of Cote d’Ivoire towards increasing cashew production and processing in Africa and iii) Financial implication: the case of India. By the end of discussions in this session, the focus on cashew processing in Africa was retained as necessary to create increased value added revenue and avoid the export of raw cashew nuts. As a result, the enforcement of the banking sector and development agencies financing cashew processing is highly anticipated. The various governments and regulatory authorities will have to play a very important role in mobilizing funds, complementing these efforts with targeted support in terms of capacity building and training to create the necessary local skills for cashew processing. The inaugural plenary was followed by the ACA Annual General Meeting (AGM) and Board Members Election. The AGM started with a report of the previous year’s activities and achievements of the Alliance by the President, Mr. Florentino Nanque. The makeup of the ACA Board consists of 3 West Africans, 2 East & Southern Africans and 4 international investors. Two people from the four international investors should be committed to contributing $25,000 and above annually in support of ACA’s activities. ACA did not receive applications from East Africa hence the Kenyan representative on the board was retained till the next election during the 2019 conference. During this year’s election, 2 West Africans were elected on to the board of which one was re-elected. ACA is happy to welcome Mr. Babatola Faseru from Nigeria and Mr. Nanque Florentino from Guinea Bissau. Facilitate access to technology, in particular by promoting technology transfer and emphasizing the local development of technologies, equipment and spare parts adapted to the needs of our businesses. Take a critical look at the question of funding in the cashew industry in view of the native banking industry’s insufficient knowledge of the cashew sector. Facilitate access to finance through the introduction of financial instruments to secure long-term financing at competitive costs which is a key to success in the development of the cashew industry in Africa. An official tour of the various exhibition areas, which included equipment and machinery, products and services as well as by-products, and finally a welcome cocktail ended the first day of the conference. The second day of the conference was packed with diverse activities. Participants had the opportunity to choose from a large array of panel themes and tailored workshops. Topics from the sessions included: Modernizing cashew production through smart agriculture to encourage youth involvement; Introducing financing incentives to encourage young entrepreneurs; Setting up and successfully developing new cashew processing units. These topics were among so many others all focusing on the conference theme: “Cashew Processing - A Mine of Opportunity for Empowering the African Youth”. One of the highlights of the second day was the B2B Meeting. For this conference’s edition, a two part workshop was organized for selected cashew processors. Facelifted by James Fitzpatrick, a cashew market intelligence expert with over 30 years of experience, the workshop covered topics on cashew market entry, sustaining market entry, strategy, communications and intelligence, as well as finally the financial institutions’ point of view: risks and requirements dealing with buyers and financial institution. At the intersession period of the two workshops, participants had personal coaching with the facilitator and were assisted to prepare a business proposal and profile. Also, during the second session the processors were given the opportunity to pitch their proposal to banks, whose top management officials were present. Another highlight was the Cashew Women Entrepreneur Meeting, which brought together women cashew experts in the various to share their experiences. Participants also had the opportunity to witness a full raw cashew nut processing chain and cashew outturn (nut quality) calculation. The day ended with a closing dinner, which was graced by the presence of H.E. the Minister of Commerce, Industry and Promotions of SME. The conference officially ended on Saturday, November 10. The third day started with a field trip to the alleged biggest processing unit in Africa called CILAGRI and located in Abidjan. The unit has an installed capacity of 100,000 MT. Just as the opening ceremony, the closing was also generously graced by dignitaries. Finally, an award ceremony was held as a way of appreciating partners and individuals who contributed to making the first SIETTA-ACA Conference a success. The official online registration was hosted on ACA’s website and 402 international participants registered on this platform. ACA is very grateful to its partners and members for the success of this edition of a joint conference with SIETTA. We look forward to hosting them again at the 13th ACA Annual Cashew Conference & Expo. This 2019 event will be solely held by ACA and will take place in Tanzania.